Gary Imlach has been part of my summer for 20 years now, so it feels right to praise one of the best broadcasters in sport. The image of him defying the elements – a thunderous storm in Northern Spain – with a carrier bag for a hat is burned into my memories as much as anything else from the Wild West before Texas – or the 1990s as it is also known. I think the occasion was Indurain riding into Spain towards the end of his Tour de France career with nothing going according to the scripted glory. If anyone has this image or video somewhere, I’d love to see it again. Perhaps that image is a stronger metaphor for reporting on that period in the sport than I’d thought before. Imlach’s was a thankless task trying to retain a degree of journalistic dignity in terrible conditions. He’s always been that to me: a journalist with integrity and honesty. Discussing the Chris Froome data leak he alluded to the classic loaded question “when did you stop beating your wife?” to the consternation of his ITV colleagues – it was the sort of allusion any journalist would get. Even in the Armstrong years, he keep a degree of journalistic distance which is difficult to maintain when presenting an event your employer is paying money for. One of the hallmarks of Gary’s coverage is his sense of perspective. Bike racing, like many other things in life is too important to take seriously. His beautifully crafted links almost always involve playfulness, humour and a sense of the absurd circus that is the Tour. When Tour coverage switched from Channel Four to ITV at short notice, his opening gambit was “No, you’re not watching the wrong channel” – a familiar yet dry way to cover the changes in one line and never need mention it again. I’m sure you all have your favourite Imlach lines and moments, including the pedalo incident. 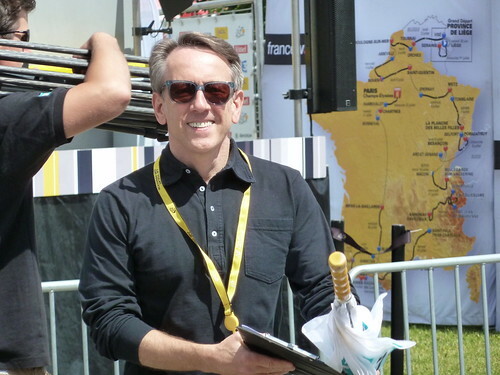 This entry was posted in Tour de France, Video and tagged Gary Imlach, ITV, Tour de France. Bookmark the permalink.